We ordered 2,500 SoundCloud Plays from BuildPlays to test how well they could deliver their services. Our Plays came just as they promised, arriving quickly the next day. 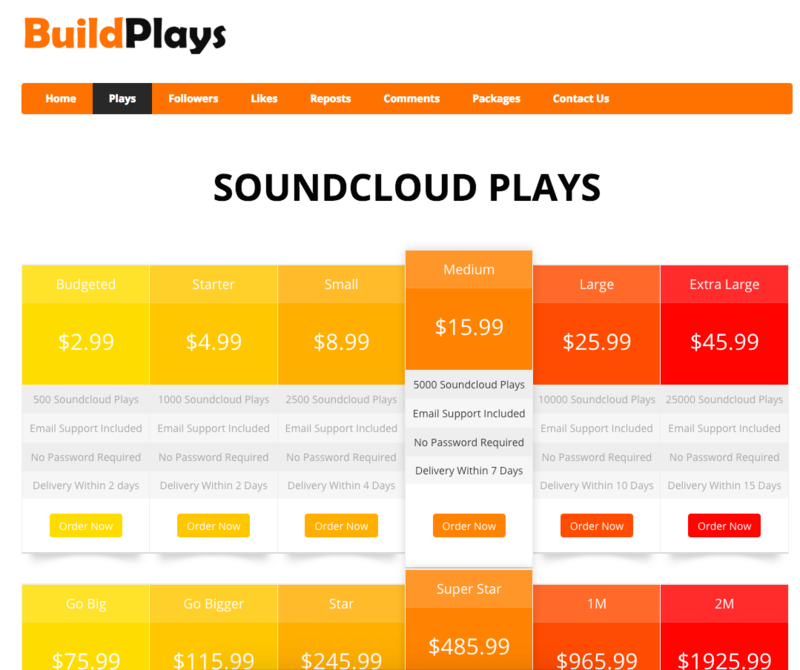 BuildPlays is a marketing company that specializes in SoundCloud services alone. They offer a variety of boosting services to improve the social proof of musicians looking to make it big. BuildPlays prides itself in delivering orders on time, providing good customer support, and offering a money-back guarantee for their services to ensure that customers feel confident when buying. They also have one of the largest Plays packages we've ever seen, at 2 million. BuildPlays offers SoundCloud Plays, Followers, Likes, Reposts, and Comments. We reviewed the terms and conditions sections on the BuildPlays website and made a few comments on their status below. To find out more details on these, then please toggle the sections to see what we thought! BuildPlays does not have a Terms of Service available on its site. BuildPlays has a 100% Money-Back Guarantee. Refunds are only issued for issues they cannot resolve. Requests for refunds should be accompanied by the reason. BuildPlays does not have a Retention and Replacement Guarantee available on their site. It’s simple to find contact details for BuildPlays. Just click the Contact Us link at the top-right and you’ll be brought to a page with some info. You can email them at the address shown below or you can send a message through the on-page chat, which is at the bottom-right of the page. We sent a message to customer support, to test their response time and the quality of their answer. We never heard a response from our first attempt, so we tried again a bit later. Eventually, we finally did get a response, as you can see. It was pretty informative, but answering our questions very briefly without going into detail. However, after this long, the response was basically worthless because a customer would have already moved on long ago. "Soundcloud won't figure out that you bought plays." "It takes various amount of time depending on the amount of plays." "They will show up within 24 hours." "real user will be playing from world wide." "Yes they are gonna play 70%+ time of your track." "No people won't know that you bought plays." "You can get it back if you have an issue." It looks like BuildPlays can deliver the services they offer, helping musicians improve their social proof on SoundCloud. Their prices are a bit higher than average in the industry, however. Our SoundCloud Plays arrived quickly and in full, the day after we ordered them. BuildPlays is a simple website that is dedicated to SoundCloud boosting services. Our order of 2,500 SoundCloud Plays came quickly and on time, just as they promised. We didn't get any extra signals of engagement with our order, like reposts or comments, so you'll need to pay for those as well if you want the service to look more natural. Although BuildPlays has a money-back guarantee, we found it difficult to get in touch with their customer support team. It took us two attempts, and the response came too late to be of any use for a customer. If you want to go with a higher-quality company, with good prices and good support, try Devumi or DDPlays. The customer support was great and helped me make the decision to make my order for 3500 plays. The plays arrived 24 hours later in full. This is a great service that i would recommend to anyone looking to increase their social proof. I got my 3000 soundcloud plays in less 48 hours. The plays were delivered in full and were of high quality. The customer support was helpful throughout the period i engaged them. I am a satisfied client. Buildplays delivered my 5000 plays in the agreed time and even added a couple more plays on top of what i paid for.Their customer support were at hand to answer my questions, this is highly recommended to any serious musician who wants to build their social proof. Ordering anything online is and has always been a gamble. I however must laud the buildplays service as it has proven to be worth the trust. Growing Soundcloud followers is quite a task. I am glad that buildplays has made me find it easier. My experience buying soundcloud followers was without any unusual events and I cannot complain.